Well, if you asked me a few weeks ago whether I would be racing at the Sandown 500, I would have laughed. 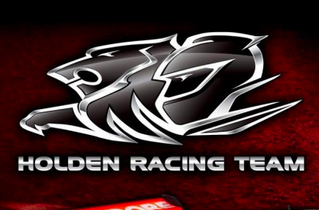 However, due to the unfortunate and bazaar accident of James Courtney at Sydney Motorsport Park the race kit got dragged out of the cupboard, dusted off and I headed to Melbourne to race the #22 car for the Holden Racing Team with Jack Perkins. I must admit I have enjoyed the whole ride more than I thought. It was actually good going to a race meeting with no expectations and no pressure, so for once could actually just go there and enjoy driving a race car. It’s quite ironic teaming back up with the Perkins name after 20 years since the Perkins/Ingall name won our first Bathurst. It was also a special moment when Larry Perkins turned up at Sandown on Saturday. I spent a lot of time with him just catching up. He is definitely one of the all time legends of the sport and by the amount of people that were lining up outside the garage when they saw him, its great to see that he is still hugely popular. I have to say, even though I’ve only been out of the saddle for only 8 months, it still takes a little bit to dial back into the groove. By the final practice session on Saturday I pretty well felt where I should be with the car. Things have definitely moved on a bit as to how you approach driving the current generation of cars and I got a great insight as to how the top guys get their speed. Jack did an excellent job to qualify 12th position so gave me a better opportunity to make places in my heat race on Saturday and to make sure Jack had a good starting spot against the main game drivers. The starts and first laps have always been my strong point so picking up 6 places on the first lap made the rest of it pretty comfortable throughout the qualifying race. With Jack starting in 6th for his qualifying heat, put us in great shape. I knew if Jack got a good start he could hold his own, as he proved at Sydney Motorsport Park a few weeks earlier. The boy got off the line well and was holding down 6th position. We knew in the pits he needed a couple of laps just to get the tyres up to temperature and it was looking good to hold that position or not far off. Unfortunately Lowndesy was a bit too eager to get past and ran in the back of Jack at Dandenong Corner spearing him off down to last position. It was a real frustration for all of us as we had such a dream run up to then. Don’t get me wrong, I have been no angel in the past and I’m sure Lowndes didn’t do it on purpose, but it still doesn’t help with the disappointment. Starting off last on the grid for Sundays main race, the only real strategy was to pit very early and depending on how good my start was dictated that. Fortunately a good start is exactly what I got, picking off six cars by lap 1 and a further couple in the next few laps. That opened up our pit stop window a bit further which ultimately led to a perfect call from the team by the time the first of the pace cars came out. Doing a 77 lap stint reminded me how hot these damn cars get. Probably paid the price a little bit by having a few too many vinos with Skaiffy with my Fox commitments this year! Saying that, I was still very pleased overall considering I didn’t have much of a lead up to get match fit so all in all to complete half the race straight up I didn’t think was too bad an effort. The other part of it which the general viewer probably doesn’t see is how hard every driver pushes the car. The pace is super quick in these endurance races which means you are driving the car on the edge a lot more hence the odd mistake by drivers. It’s certainly a very competitive Championship and a credit to all the teams that build these cars that you can push so hard for so long. Handing the car over to Jack in a reasonable position and probably the freshest of all the drivers made our strategy work quite well. Jack has come a long way with his driving and definitely a lot more relaxed. Considering he was up against some class drivers, he didn’t let them get on top of him. Finishing 9th from where we started was a great effort all round and bearing in mind the events that happened leading up to this, it was almost a perfect result. Big thanks to everyone concerned. I certainly enjoyed my time in the car and now will sit tight and see how JC’s recovery process goes in the next few weeks and makes a call whether he is going to race at “The Big One”. I will have helmet in hand in case I get the call up but in an ideal world it would be great to see James back in the #22. On a personal note, I would very much like to thank everyone for your support in my return behind the wheel and especially Holden Racing Team for making me feel welcome and of course Fox Sports for giving me a leave pass and Mark and Jess for taking up the slack on the telecast. Welcome to #HRTDriverDissection, where we ask our boys the IMPORTANT questions! Check out my interview with Roland Dane at Sydney Motorsport Park on his thoughts about the Gen 2 Changes coming. Finally got my chance to get behind the wheel of the Car #22 Holden Racing Team machine ahead of Sandown this weekend. Champion turned FOX SPORTS motorsport expert, Russell Ingall will replace injured Holden Racing Team star James Courtney at the Wilson Security Sandown 500, to be held on 11-13 September. Ingall will partner Jack Perkins in the #22 HRT Commodore for the traditional warm-up to Bathurst. Courtney has been ruled out of the race due to injuries sustained when struck by flying debris from the downdraft of a helicopter at Sydney Motorsport Park last Friday. 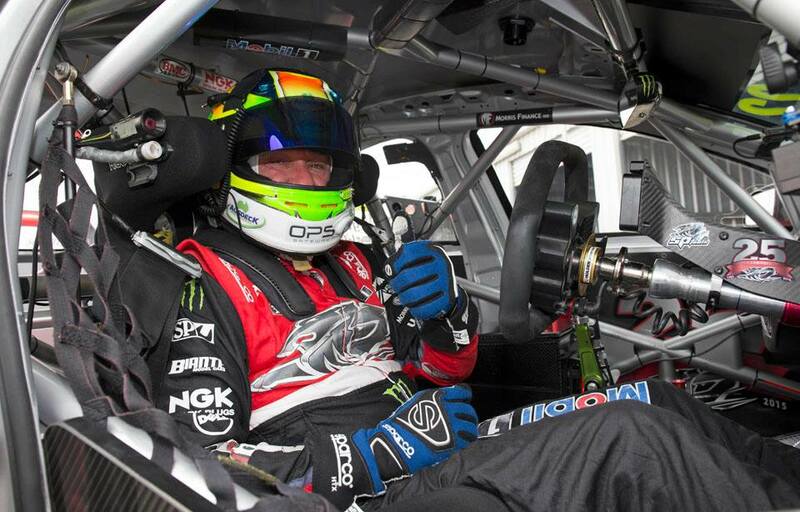 Ingall retired from full-time driving at the end of last season, joining FOX SPORTS’ unrivalled V8 Supercars coverage after a distinguished racing career spanning almost two decades. 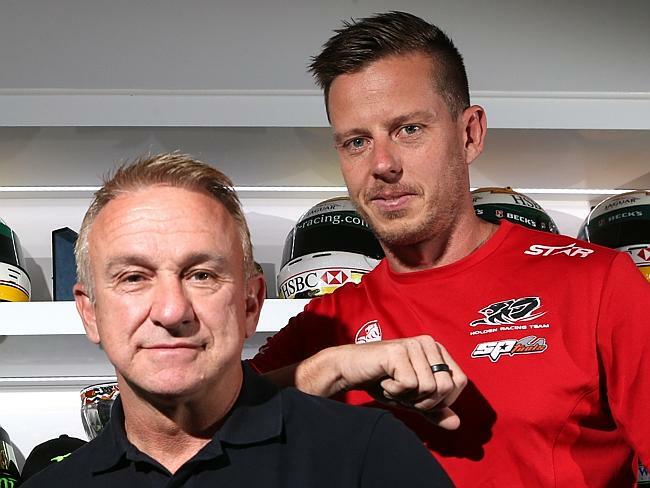 Ingall said the call to fill in for Courtney was unexpected, but he was honoured to help out his long-time friend, and had the best wishes of FOX SPORTS management. “I’ve been very happy and comfortable working with FOX SPORTS on its V8 coverage, but when the call came to help out a mate I didn’t hesitate,” Ingall said. “Jack’s also a mate and while he’s disappointed not to be driving with James as planned, we’ve driven together in the past and he understands the need for an experienced replacement. 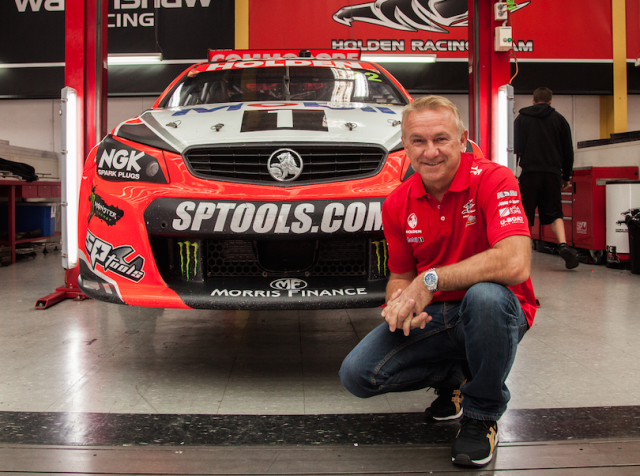 Ingall said driving for the famous Holden Racing Team would also be a special moment in his career. “Racing a red Commodore for Holden’s factory team is at the top of every driver’s wish list, including mine, and I thought my chance had passed,” he said. With Ingall joining V8’s most successful team, FOX SPORTS will take viewers closer to the action than ever before when it embeds a crew in the team garage for the event. As Team Insider, Ingall will deliver fans unprecedented access to HRT’s inner sanctum and provide insights across the weekend. “As HRT does battle on the track, viewers will see firsthand the operations of its pit crew in action, which will make for incredible viewing,” Ingall said. Courtney admitted it will be difficult watching from the sidelines, but knows his HRT Commodore is in good hands. “It’s a tough situation – I’m not happy about missing the race, but if I have to then we need someone familiar with HRT and our cars, and Russell fits the bill,” Courtney said. After pursuing an open wheel career in Europe, Ingall first rose to prominence at home in Australia when he partnered Holden legend Larry Perkins in their famous “last to first” Bathurst win in 1995. The victory earned Ingall a fulltime V8 drive with Perkins’ team the following year, with the pair taking another victory at Mt Panorama in 1997. After four series runner-ups, Ingall crowned his career by winning the 2005 V8 Supercars Championship. Ingall teamed with Jack Perkins for the 2011 enduro season, finishing eighth at Bathurst. If you missed my “Enforced” segment earlier on in the V8 season on the Fox Motorsport V8 Supercar Telecast about testing, check it out here. These have been so popular I will be bringing them to you right here on my website to see again. The “Paperclip” as its known has had exciting races in the past and sometimes processional races. On the weekend there was a bit of both. Starting off on Friday’s practice, we saw the first real hit out of co-drivers with the Endurance races looming. It’s definitely a tough gig for the co-drivers this year with next to no testing allocated and if some of these drivers aren’t competing in another category, then they are really getting thrown in the deep end. I am making a bit of a prediction here that the Championship this year will be dictated by the 3 endurance races and in particular their co-drivers. With so many points up for grabs over these events and the Championship Points table still fairly close, the co-drivers will have a major bearing. There will be huge pressure on them to perform and not make any mistakes. Tough ask when they have had little miles in the car. For more on this, see my Fox Motorsport “Enforced” segment from the weekend when it’s posted on this site for my full views on testing. Qualifying for Saturday’s races was fairly predictable with the Pro Drive cars again very dominant. The only surprise being Craig Lowndes qualifying fastest in the second race. It’s good to see Triple 8 gradually finding speed and taking the fight back up with Pro Drive. We interviewed both Roland Dane and Tim Edwards on the Fox Sports Panel over the weekend and great to note a mutual respect for each of the teams and what they are achieving between the two and more importantly, not sighting things like “aero” or anything else technical in fact, being the reason for the current situation. Just admitting that the Pro Drive team are doing a better job and Triple 8 have to lift their game. Good to see and hear. Race 1 was actually quite exciting with a lot of hard and fast racing up and down the field and everywhere you looked there were big moves going on with elbows out. In particular there was a great battle with Chaz Mostert and Shane Van Gizbergen right from the green light with both drivers using plenty of aggression but keeping both cars on the black stuff. Even better was watching these drivers get interviewed after the race and neither of them whining or moaning, just saying it was good hard racing and each giving as good as they got. Maybe a few others could take note of the attitude of these two drivers! I tipped Winterbottom for the race 1 win because I knew starting grid 2 on the outside, cleaner part of the track he would get a better start and he did, straight into the lead and never headed. Mark is definitely driving like someone that wants that Championship and is doing everything right to get it. Race 2 on Saturday was a lot more sedate which surprised me because usually the soft tyre races make for better racing. That’s the problem with both the hard and soft tyre, they are too durable and there is not enough deterioration and I hope that V8 Supercars take note of this when they are doing the soft and super soft tyre evaluation later this year. We definitely don’t want to make the tyres too hard-wearing, we want deterioration, that way for the pit stop races it will produce more strategy and the shorter Super Sprint races will be more about how the driver manages the tyre deterioration putting it more in their hands. Winterbottom again led from start to finish, but this time was pushed very hard by a resurgent Craig Lowndes. The pace of the Triple 8 cars on soft tyres was actually quite good and it would have only taken a small slip up from Winterbottom for Lowndes to get past, but Frosty didn’t put a foot wrong and I have to say, leading a race with that much pressure is incredibly difficult, knowing that you can’t make a single mistake, so in my books that was a job well done. It seems to me that the biggest advantage that Pro Drive have is their ability to be fast on both the hard and soft tyre. From what I see, other teams are either fast on one or the other but not both which is where the issue lies. Once you get to the pit stop races where both tyres are to be used, these teams are going to and have struggled. 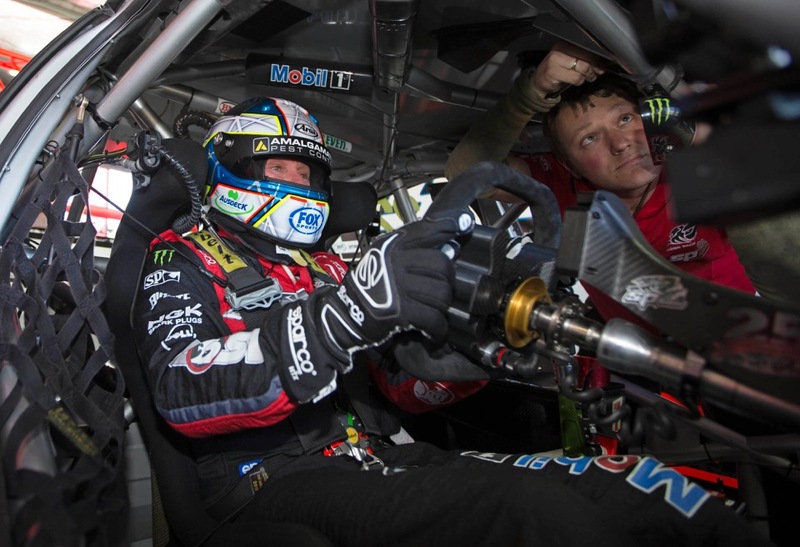 This time it was Mark Winterbottom’s teammate, Chaz Mostert time to shine. He was never really headed and it was the pace on the hard tyres that won him the race. I was keeping an eye on the lap times throughout the whole race and Chaz was lapping just as fast on hard tyres as what most around him were doing on softs. Without any safety cars there was no way Mostert was going to be run down. Unfortunately the race did spread out and a NASCAR style competition yellow would have been quite handy, I still reckon V8s should look at this to keep the racing closer. After all it is all about the entertainment. That’s pretty well how it ended with another strong result from Lowndes in second showing he had good pace and Winterbottom picking up more points in third. A couple of notable surprises to me, was firstly Whincup. I can’t see why Lowndes has picked up his game and Whincup still seems to be struggling. He definitely didn’t have the qualifying speed and Lowndes seemed to have him covered even in race speed. There must be a bit of soul searching going on down there on the Number 1 car. The other was Shane Van Gisbergen in the Tekno team car. I don’t know what’s happening down there lately but what started off as a promising year, is definitely becoming unraveled and I can see frustration on Shane’s face as he should have been a real Championship contender this year. It’s not like Shane has forgotten how to drive so something is definitely not right with that car. So that was Ipswich. A reasonable weekend of racing and overall it is starting to narrow down who the Championship contenders are going to be for 2015. 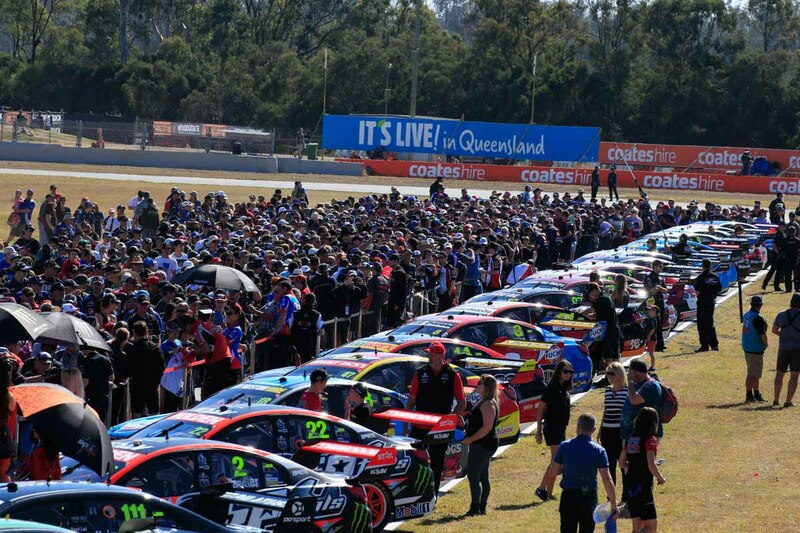 Sydney Motorsport Park is the next round and unfortunately for everyone else that is not in a Pro Drive car, that circuit is going to suit them to a T. The only thing the other competitors can hope for is rain, which could very well happen. Cheers for now and keep checking this website for news and reviews. If you missed my “Enforced” segment earlier on in the V8 season on the Fox Motorsport V8 Supercar Telecast about super soft tyres, check it out here. These have been so popular I will be bringing them to you right here on my website to see again. 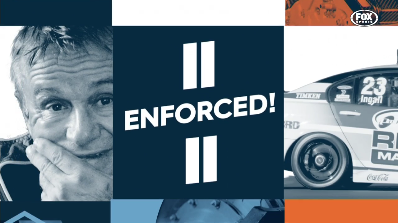 If you missed my “Enforced” segment earlier on in the V8 season on the Fox Motorsport V8 Supercar Telecast about hard racing, check it out here. These have been so popular I will be bringing them to you right here on my website to see again.